The recycling message is an important one to us at Totally Kids. Green Halloween, National Costume Swap Day is a fun way of teaching our kids that they too can take a personal responsibility in helping save Mother Earth. 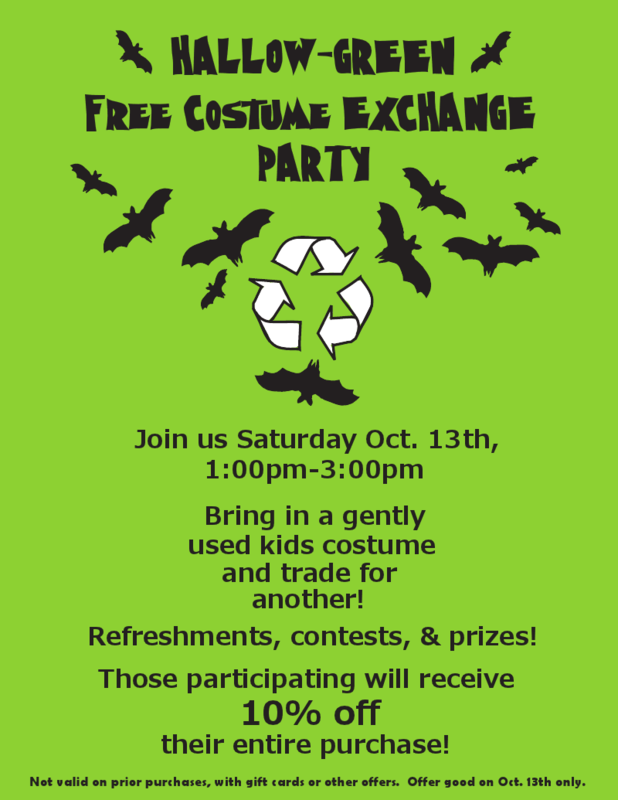 Bring in a child size Halloween costume to swap and take home a “new to you” one. Hop on your brooms and fly in for fun and games, prizes, hot cider and treats. Start bringing your costumes in NOW! Before you visit us, check under your beds and back of closets for any gently used toys that the kiddos are no longer playing with or need. The toys for Autism collection is a GREEN project that is ongoing year long. is accepting all toy donations to benefit the locally headquartered group “Parents United Against Autism”. We’ll take the donated gently used toys to local families in need. Aside from helping our friends and neighbors, this is an excellent opportunity to clear out your closets a little and keep those unused toys from ending up on a landfill for the next 100 years. Please bring whatever you can. Make an Egg-stra Special Recycled Bat at home. All Free Crafts will show you how. Green Halloween food tip: Eat your leftovers! There is over 29 million tons of food waste each year, enough to fill the Rose Bowl every three days and the rotting food in landfills contributes to global warming.